Is your Oster Blender Jar missing, cracked, leaking or broken? You may need a new Oster Blender jar 025843-000-000. This Glass blender jar fits most Oster Blenders, Osterizers and all Oster Kitchen Centers. 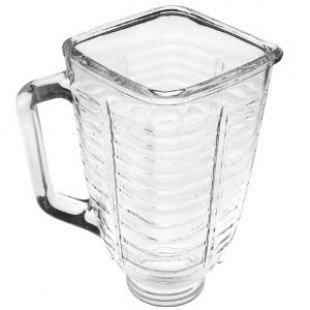 Leaky blender jars are history when you replace with this original Oster blender part. This 40 Oz. jar uses a square-shaped lid . 0041 2725 2726 2731 2742 2743 2771 4090 4093-8 4094 4096 4098 4100-8 4101-8 4102 4105-8 4106-8 4108-8 4109 4110 4111 4112-8 4114 4115 4117 4125 4126 4127 4129 4134 442 4648 5000-08 5000-25 6010 6627 6640 6641 6642 6643 6644 6645 6646 6662 6663 6664 6667 6668 6675 6676 6677 6684 6801 6805 6808 6848 6849 6851 6853 6881 848-31 852-08 852-20 854-35 861-66 862-06F 867-28 869-18 880-20 887-20 890-08 890-20 890-22 890-30 979-08 979-23.